Karra and I got busy peeling. The first 25 lbs. of peaches went toward the jam making. In jam making, I learned, you have to use fruit pectin and the best known brand is Sure-Jell. We decided to use Sure-Jell Low Sugar fruit pectin, rather than the regular version, as it calls for much less sugar - meaning fewer calories and lower overall cost. 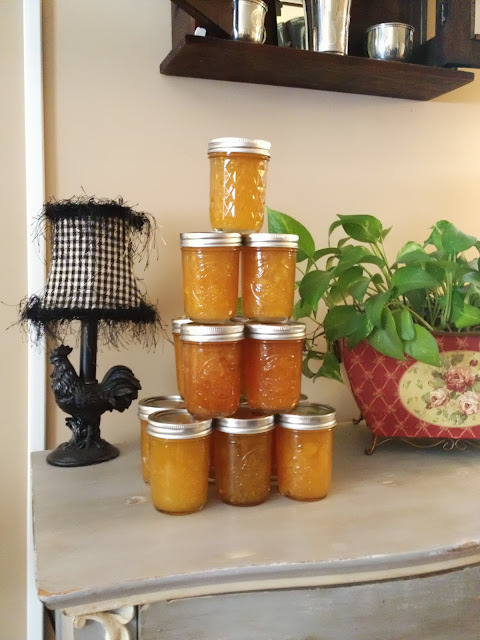 We followed the recipe that came in the package for peach jam, which can be found here. 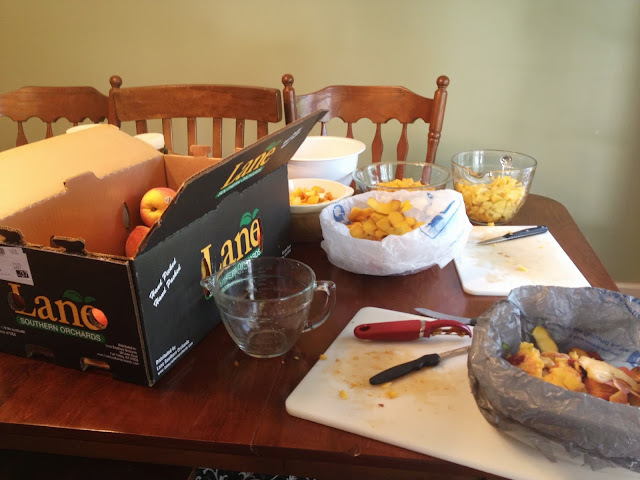 The 25 pounds of peaches produced enough fruit for 9 batches. As we were peeling the peaches, the jars and rings were being run through the dishwasher not only to clean them, but also to heat them on the drying cycle. Once we cooked the peach mixture according to the Sure-Jell recipe and it was piping hot, we boiled the lids and laid a folded beach towel on the counter. 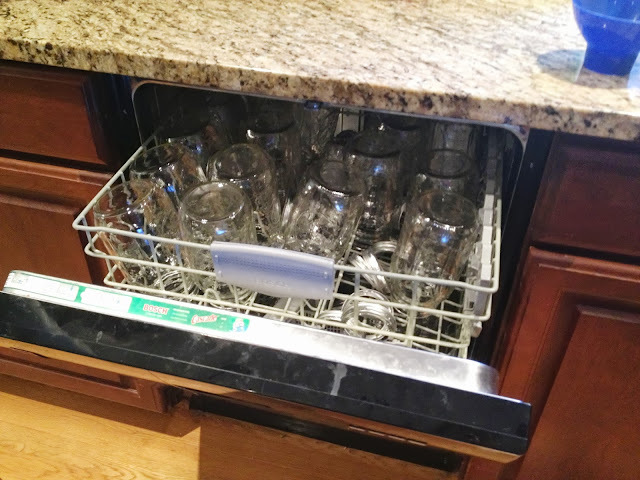 Karra took a few jars out of the dishwasher at a time, along with that many bands, then quickly closed the dishwasher to keep in the heat. I quickly poured the jam into one jar at a time, filling all the way to the top. Karra wiped the rim of the jar off, pulled a hot lid out of the pot using a nifty magnet-on-a-stick thingy, put it on top of the jar, and secured it with a band. It was then placed on the towel, upside down, and covered with another beach towel. After 5 minutes we turned them right side up, then recovered them with the towel. 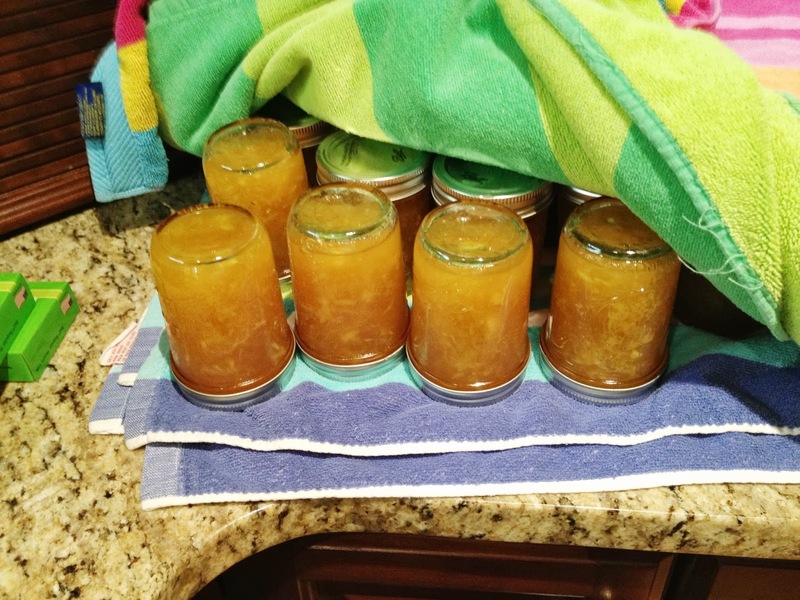 We repeated this, using a few jars at a time, until we were out of peach jam mixture. The 25 lbs. made 48 half-pint jars of golden-colored jam. After a while we checked to make sure none of the lids "gave" when pressed in the middle. Karra says that if they do, those need to be processed in the canner the old-fashioned way. 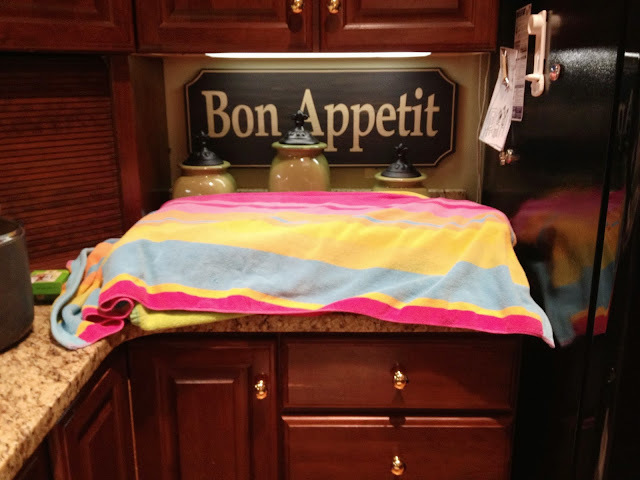 We then let them sit, covered with the towel, for 24 hours. That was it! If I knew canning could be this easy, I would have done it ages ago. Want to know what we did with the other 25 lbs. of peaches? Cobbler-In-A-Jar! Tomorrow I'll share the recipe with you. Thanks for visiting and following, Faith! Let's can some ketchup soon! !